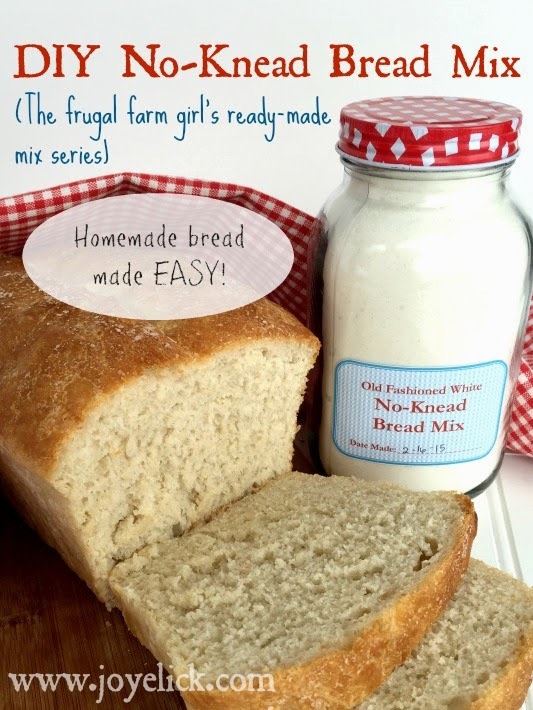 DIY No-Knead BREAD MIX: The frugal farm girl's ready-made mix series. There's nothing quite so homey as the smell of fresh bread baking in the oven. But are you someone who shakes in your boots when it comes to working with yeast? Yeast can be temperamental. That must be why, when I was growing up, my mom would always hush the kids, or make sure we didn't slam doors when she was baking bread, lest we make her loaves fall. Now, with a family of my own, I enjoy making bread--activating the yeast, working in the flour, getting a work-out from kneading. But I'll admit, though I enjoy the traditional bread making process, I also like simplicity and saving time. That's why I keep several varieties of No-Knead Bread Mix in my pantry. Mixes eliminate half the work of putting bread on the table. Just mix, let rise, and bake. Easy. No gathering dry ingredients, no flour everywhere, no kneading. 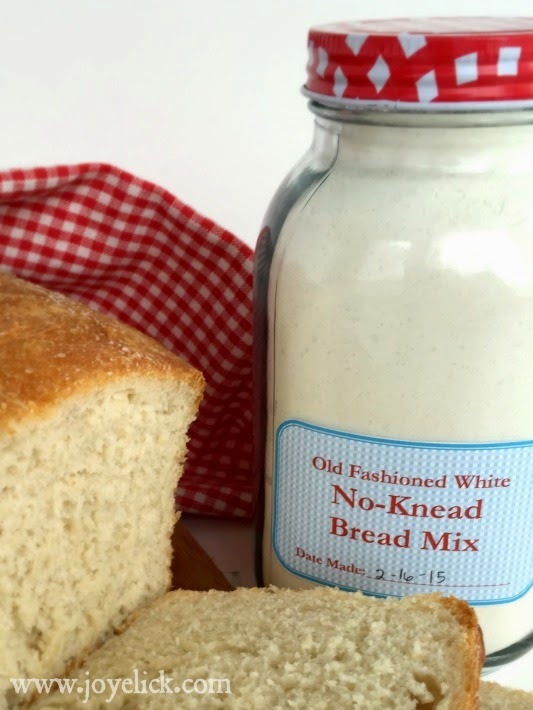 No-Knead Bread Mix is a smart, practical way to keep fresh baked bread coming out of the oven each day. (Plus, this bread mix is extremely frugal, as each one costs under $1 to make). Today, I'm going to show you how to make No-Knead Bread Mix, then how to turn your mix into a loaf of delicious homemade bread. Are you ready? Then come meet me in the kitchen and let's get started! In a large bowl, whisk together the dry ingredients until thoroughly combined. 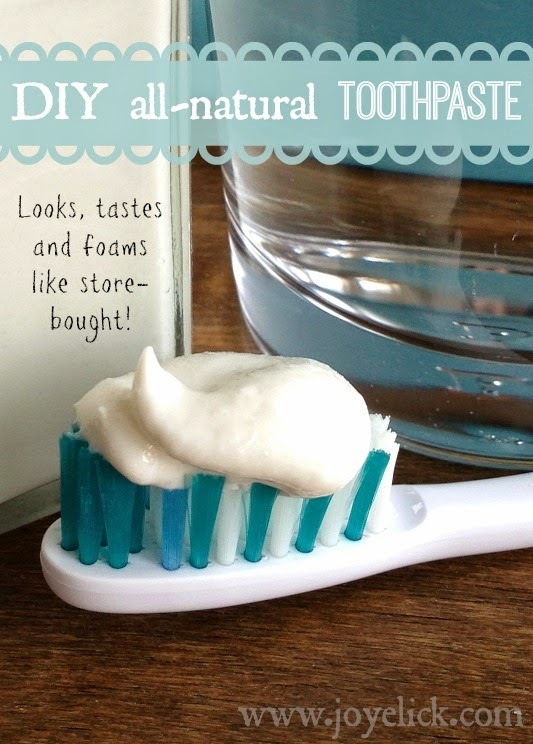 Store mix in a quart-size jar, or another air tight container in your pantry. Use within 4 months. (Affiliate link leads to a set of 12 smooth surface jars for easy labeling, though the description on Amazon.com seems to be for only 1 jar). Step 1: Mix it up. In the bowl of a standing mixer, combine the mix with the water and vinegar. 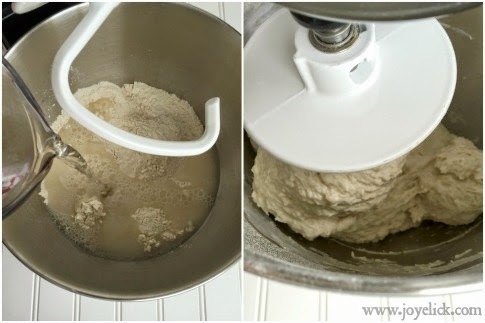 Using a dough hook, run the mixer on low-medium speed, mixing just until a ball of dough forms. Step 2: Let it rise. Place the ball of dough in a large, oiled bowl. 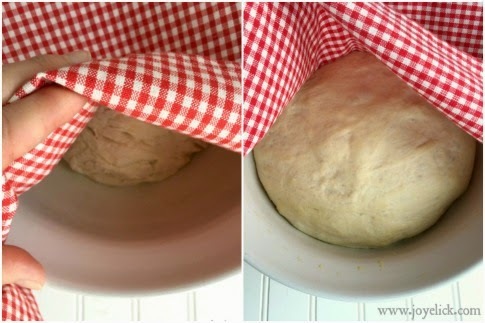 Rub a bit of oil over the surface of the dough, then cover with a clean towel. Leave it to sit in a quiet place that's at least 70 degrees for 1 1/2 hours, or until dough doubles in size. Step 3: Punch dough down and form a loaf. When the dough is doubled in size, punch it down gently. Spray a 9 X 5 loaf pan generously with cooking spray. Form the dough into an oblong loaf shape and tuck the ends under. Place it in the loaf pan, cover with the towel again, and let it rest for about 45 minutes. Step 4: Butter and bake. Just prior to baking, slit the top of the loaf with a sharp knife about a 1/4 inch deep, to allow steam to vent. Brush the surface with melted butter and sprinkle a pinch of kosher salt over the top. Step 5: Bake and enjoy the homey-good aroma. 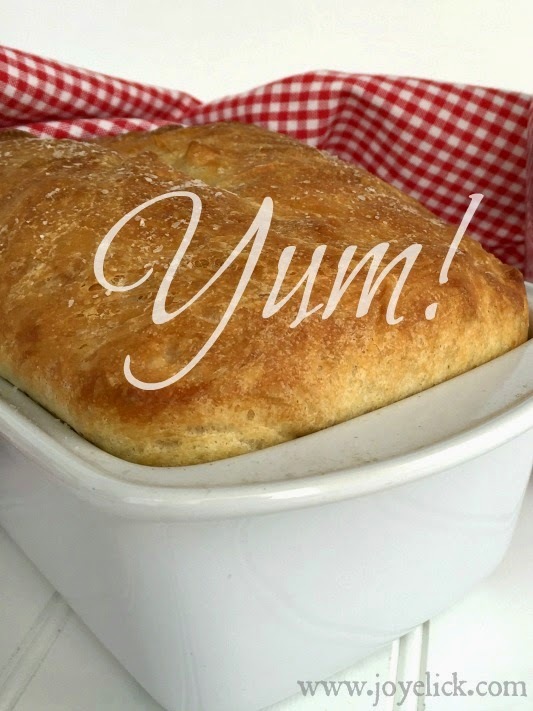 Place the bread pan on the center rack in your oven and bake at 450 degrees for 25 minutes. When done, the top should be golden brown. Remove the pan from the oven and carefully place it on a wire rack to cool for 5 minutes. Then turn the loaf out and allow to cool entirely before cutting to serve. 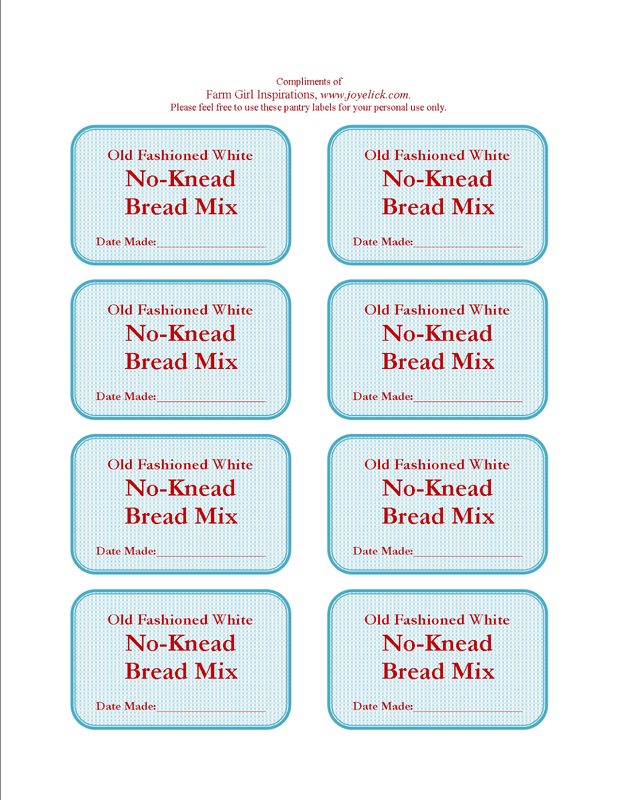 CLICK HERE to download your free No-Knead Bread Mix Labels. 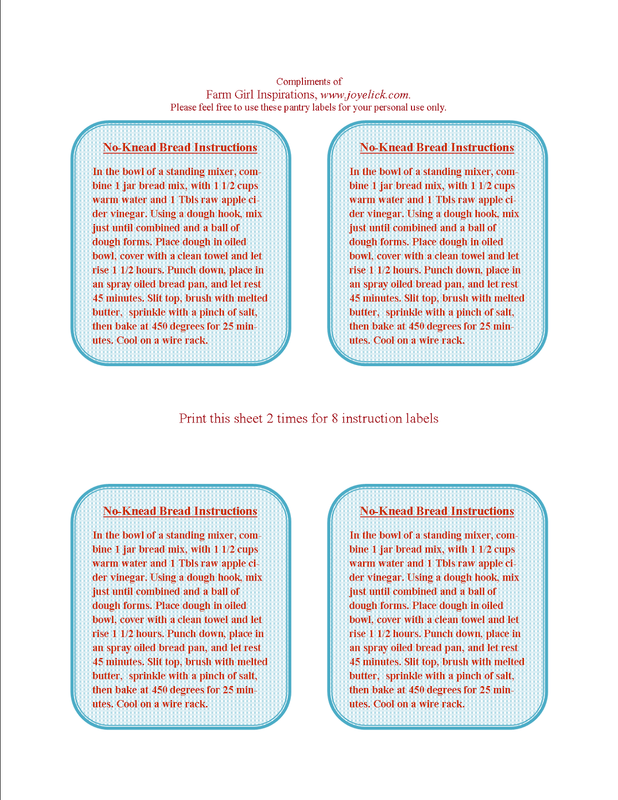 CLICK HERE to download your free No-Knead Bread Mix Instruction Labels. LET'S CHAT...What strategies do you use to fit bread making into your life? I'd love to hear from you in the comments below. Homemade CHILI SEASONING MIX: The frugal farm girl's DIY ready-made mix series. Homemade GOLDEN CORNBREAD MIX: The frugal farm girl's DIY ready-made mix series. Homemade GRANOLA BARS: Create endless variety with just one recipe chart! This looks fabulous! I'm going to pin this for later so I can remember to give the mix with our jam for Christmas this year. Thanks for the labels, too. They are super cute! What a great recipe. Gift giving at its finest. Can you tell me how long these can stay on a shelf. I'd like to make them up ahead of time. These would make perfect gifts! I believe that if using all purpose flour, they can last 1 year on the shelf, and if using whole-wheat, they should be used within 4 months. 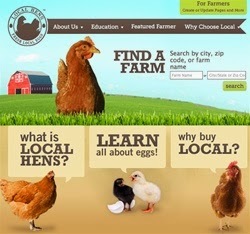 However, you could keep them in the freezer and they will last longer--6 to 8 months. As I understand it, whole grain flours contain more oils that can go rancid over time. (If freezing this mix in jars, wide-mouth jars are considered freezer-safe). Hope that helps. Thanks so much. And great idea Angi to include homemade jam with the mix. I know what I'll be doing for Christmas this year.